This article provides in-depth fundamental analysis of Divi’s Laboratories Limited. Divi’s Lab is a Hyderabad-based Indian pharmaceutical manufacturer, which focuses on making active pharmaceutical ingredients (API) and intermediates as primary business activities. Divi’s Lab (DLL), established in 1990 by Dr Murli K Divi., is a Hyderabad, Telangana (India) based company involved in the production of Active Pharma Ingredients (APIs) & Intermediates. Divi’s Lab is listed on both Bombay Stock Exchange and National Stock Exchange in India. We can see that over last 10 years (2007-16), DLL has increased its sales at a healthy rate of 20% per annum. It has been able to maintain its operating & net profit margins (OPM & NPM) at healthy levels of 34-38% and 26-30% respectively. When we would compare NPM of Divi’s Lab with its peers later in business analysis, we would realize that Divi’s Lab has one of the best profitability margins in the industry. Divi’s Lab has been maintaining its leverage levels within comfortable levels of serviceability. Interest coverage ratio has always been very healthy. This is a sign of a healthy company. We can see that Divi’s Lab has been consistently generating cash from its operations and using it for capital expenditure. NCF is lower than cash at end of year also a lot of cash inflow is happening from financing activity– what does that signify? If we compare the cumulative PAT and CFO for last 10 years (2007-16), we realize that company has collected cash less than its profits. It indicates that the company’s profits are stuck in receivables & inventory – Is this a cause for concern? After analysis of financials of Divi’s Lab for last 10 years (2007-16), we realize that it is growing at a healthy growth rate while maintaining good profitability margins. Divi’s Lab is able to increase its sale by capacity expansion without overly leveraging its balance sheet, as it has been using cash generating from operations to pay off its lenders. The company is in a comfortable debt-servicing situation, which is reflected by its healthy interest coverage ratio. However, rising inventories and receivables is a concern that needs to be investigated into. The above table indicates that the sales growth achieved by Divi’s Lab over last 7 years has been contributed equally by product price increase (measured by revenue per MT,) and increased quantity of product sold (measured by production capacity). This is a good sign that Divi’s Lab is not relying solely on product price increases to achieve sales growth but also expanding its reach in markets by selling higher quantities. We can see that though the profit margin has been fluctuating over the years, it has still been able to maintain it at respectable levels of 27-30%. The above table reflects that the profits of Divi’s Lab are being stuck in the receivables and inventory. This is not a good sign and needs to be investigated. We can see that the company passed the test of creating at least one INR of market value generation for its shareholders for each INR profits retained by it over last 10 years. Upon testing Divi’s Lab at all the 5 parameters to judge the business performance, it has passed on 4 of the five parameters. It has demand for its products in the market that it is able to tap by selling higher quantities and able to pass on the increase in its costs as higher prices to its customers. The cash generated is being utilized productively in capacity expansion and debt reduction and it has created equivalent market value for its shareholders. Its profits are being stuck in receivables & inventory and are realized as cash. I have used the framework provided in the article: How to do Valuation Analysis of a Company to analyse Divi’s Lab’s share market data for determining whether it is available at attractive valuations. At February 5, 2017, Divi’s Lab is available at a P/E ratio of 18.08, which is cheap when compared with its peers. If we see the whole package of conservatively financed growth rate while keeping healthy profitability margins, Divi’s Lab comes out to be a clear winner among its peers. If we compare the PEG ratio in the above table, we come to the same conclusion that Divi’s Lab presents a case of healthy growth, which is available cheaply in the market. This is a one of the desirable quality of an investment worthy stock. At P/E ratio of 18.08, Divi’s Lab provides an earnings yield of 5.5%. If we compare it to the 10-year government securities (G-Sec) yields, which are currently in the range of 7.0-7.25%, then we realize that, as per Benjamin Graham’s teachings, Divi’s Lab margin of safety is not adequate for the investors. If we give the benefit of FCF and SSGR then the current P/E is already at the max range an investor should enter into the stock. Divi’s Lab paid a dividend of INR 10 for FY2015-16. At the current price (February 5, 2017) of INR 760, it provides a yield of 1.32%. After doing the valuation analysis of Divi’s Lab and comparing it with its peers, we realize that Divi’s Lab provides an opportunity of investing in a conservatively financed consistent growth story with healthy profitability margins at slightly risky prices when compared to its peers as Divi’s Lab doesn’t provide a healthy margin of safety for its shareholders. Divi’s Lab is promoted by Dr Murali K Divi, who holds a doctorate degree in Pharmaceutical Sciences. He plays an active role in the management of Divi’s Lab. He has extensive experience of over 30 years in the Active pharmaceutical ingredients industry. The board consists of eight directors. Three out of the four executive directors are of promoter’s group besides four independent directors. Web search about Dr. Divi and other directors did not reveal any negative information. Dr Murali K Divi has introduced his son into the board of directors. Mr. Kiran S. Divi was inducted in FY2001 in the board as directors. Dr Murali K Divi is currently about 65 years of age and Mr Kiran S Divi is aged 40 years and has been working as Director Operations since last 16 years. The above table reflects that the remuneration of directors of promoter’s family has in line with the profits of Divi’s Lab. Is there a benchmark % that the director’s remunerations be? Divi’s Lab promoters & managers have increased its production capacity from about 4000 MT in 2009 to 8809 MT in 2016. This reflects that the promoters and management have good project execution skills. This experience would be useful for further capacity expansion projects that would be essential for future growth. We can see from the above table that as net profits of the company have increased over the years, the dividend paid by Divi’s Lab to its shareholders has also increased. In fact, dividend payout has increased at a higher rate than profits. In 2015 Divi’s Lab also gave a 1:1 bonus issue. This pattern indicates that the company is rewarding its shareholders by sharing the outcome of its growth over the years. This is one of the signs of a shareholder friendly management. Current shareholding of promoters in the company is 52.06% (February 5, 2017). Divi’s Lab has 19.57% FII shareholding at Mar 31, 2016. After analyzing the management of Divi’s Lab, we can notice that it has a competent management, which cares about shareholder’s interests and believes in company’s future. Dr Divi seems to have put in place a succession plan, which would enable the next generation to take over the company by the time he retires from the day-to-day management of Divi’s Lab. P/E is already higher then and hence margin of safety is not there even after adjusting it for FCF & SSGR factor. Salary increment to staff and directors seems to be too high, higher than sales growth. Director’s remuneration vis a vis Net Profit is it as per benchmark or is higher? A lot of MF have reduced their holding in the company though not very significantly in FY 15-16, FII already hold 19.5%, is there upside left in this stock? OPM% is dropping year on year, it could be linked to company’s pricing power. How do we find out the reasons for this? The tax rate is less than the corporate rate which could be because 2 of the plants are in SEZ, how can this be confirmed? CFO in most of the years is lesser than PAT. How to find out the reasons for the same? Debt is negligible but on the rise for last 2 years. Should that be a cause for concern? Thanks for sharing your analysis of Divi’s Lab with the author and readers of the website. We appreciate the hard-work put in by you in the analysis. We have noticed that the above analysis is based on standalone financial performance of Divi’s Lab. The company has two subsidiaries that are based out of the USA and Europe, which currently have a minor scale of operations as compared to the main entity Divi’s Lab. Therefore, standalone financials form the bulk of the overall financial position of the company. However, it is preferable that while analysing any company, the investor should take a view about the entire entity including its subsidiaries if any, so that she is aware of the complete financial and performance picture of the company. Therefore, we always advise that investor should focus on the consolidated financial position of the company. Therefore, while analysing the performance of last 10 years for Divi’s Lab, we have analysed the consolidated financial performance of the company. Even for the current financial year (FY2017), as per the press release dated February 4, 2017, by Divi’s Lab for December 2016 quarterly results, the company has stated that it has done about ₹180 cr. of capex in 9M-FY2017. It has also communicated that at December 31, 2016, about ₹400 cr. worth of capital work in progress has been incurred, which is expected to lead to the growth in coming years. The company has been expanding its capacity on a continuous basis and in such a scenario, the project execution skill of the management to complete the ongoing projects within reasonable time & costs becomes a key differentiating factor between the companies. Completing the projects on time as projected, is essential as otherwise, there is a risk of the company losing out on the customer orders as well as an increase in costs due to increasing labour costs, increasing raw material costs in inflationary scenarios etc. While communicating with the shareholders, in the FY2016 annual report, Divi’s Lab has informed the stakeholders that its ongoing capital expansion should get completed and the plant gets operational within FY2017. As per the above-mentioned press release, the plant is yet to get completed for about 2 months in the financial year to spare. It is advised that the investor should focus on the communications from the company as well as other reports like management interviews, equity research reports from brokerages and try to track the progress of ongoing capital expansion projects. The credit rating agency CARE Limited, in its report for Divi’s Lab in October 2016, has highlighted the timely project completion as one of the key rating sensitivities. An investor would notice that CARE Limited has highlighted that Divi’s Lab has a product concentration risk with top few products constituting the bulk of the sales. When an investor analyses the annual report of Divi’s Lab for FY2016, then she gets to know that the top 5 products constitute about 43% of the total revenue. We believe that product concentration might not be a challenge if the company is a market leader in the products and the management has been dealing in those products since long and has built in formidable expertise in the products. On the face of it, the sole parameter of the revenue share of 43% from top 5 products does not seem too high a risk if the company is able to handle the associated factors well. As on date, the company seems to be doing well in protecting its profitability as it has been able to maintain healthy profitability margins. 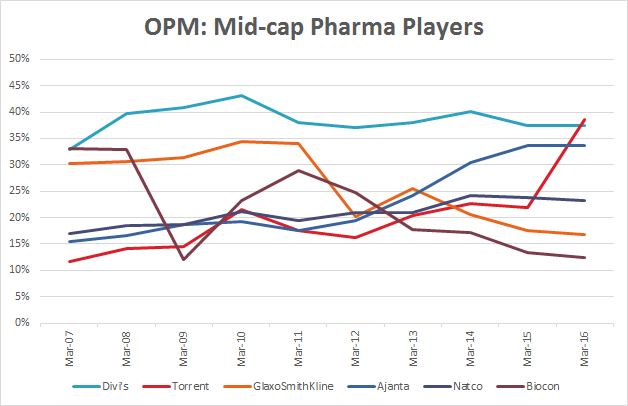 An investor would notice that over the years, the operating profit margins (OPM) of Divi’s Lab, have been continuously in the range of 37-40%, which is higher than the profitability margins shown by other similar sized (by market capitalization) Indian pharmaceutical players: like Torrent Pharmaceuticals Limited (Mcap: ₹21,330 cr), GlaxoSmithKline Pharmaceuticals Limited (Mcap: ₹22,600 cr), Ajanta Pharma Limited (Mcap: ₹15,350 cr), Natco Pharma Limited (Mcap: ₹13,300 cr) and Biocon Limited (Mcap: ₹22,500 cr) etc. The above chart shows that the OPM of Divi’s Lab is substantially higher than its similarly sized peers (by market capitalization). OPM of most of other players is within the range of 20-25%, whereas the OPM of Divi’s Lab is about 37-40%. On the face of it, such profitability margins are very good and it indicates that the company might be enjoying very good relationships with its buyers, which are primarily large global pharmaceutical players, which use the API and intermediaries supplied by Divi’s Lab into branded generics. An investor would notice that Divi’s Lab is primarily an active pharmaceuticals ingredients (API) and intermediaries manufacturer, which for pharmaceutical industry can be compared to the outsourced auto-ancillaries business in the automobiles industry. It is a common perception that in the supply chain, usually the OEM retains the highest margins and squeezes out the profitability margins out of the vendors. In the case of pharmaceutical space, the analogy can be thought as the case of players like Divi’s being the vendors and the players selling branded generics as the OEM players. However, the investor would notice that the OPM of Divi’s Lab is also significantly higher than the players, which are into branded generics. The investor would notice that the OPM of most of the players in the branded generics space like Cadila, Cipla, Aurobindo, FDC etc. is in the range of 20-25%, which is significantly lower than the profitability margin enjoyed by Divi’s Lab. It is advised that the investor should dig deeper into advantages that Divi’s Lab has as compared to its peers, which are allowing it to have superior margins over the peers. It is expected that higher margins attract higher competition, which in turn leads to lowering of profitability margins for the players going ahead. Divi’s Lab has been enjoying a net profit margin of about 27-30% over the years, which seems very good. In fact, the NPM of Divi’s Lab is higher than the OPM of many of its peers. Such performance warrants deeps study into the sources of competitive advantages by the investor. The tax payout ratio of Divi’s Lab is slightly lower than the corporate tax rate in India, which as rightly mentioned by you, seems to be due to the SEZ units and export nature of the business of the company, which enjoys concessional tax rates by the Govt. Operating efficiency parameters of Divi’s Lab reflect that the net fixed assets turnover (NFAT) has been within the range of 2.4 to 2.8 over the years. It indicates that the company has been able to improve the utilization levels of its previously done capital expenditure as it has continued to invest in fresh capacity on an ongoing basis. Working capital efficiency parameters of Divi’s Lab and its comparison with similar sized (by market capitalization) pharma peers reflect that Divi’s Lab has lower inventory turnover when compared to its peers. 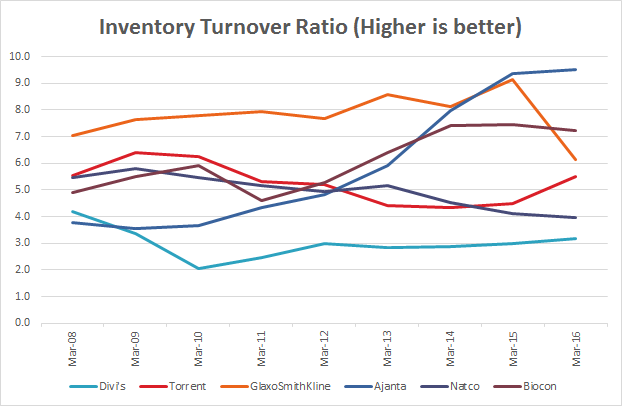 The below chart compares the inventory turnover ratio (ITR) of Divi’s Lab with Torrent Pharmaceuticals Limited (Mcap: ₹21,330 cr), GlaxoSmithKline Pharmaceuticals Limited (Mcap: ₹22,600 cr), Ajanta Pharma Limited (Mcap: ₹15,350 cr), Natco Pharma Limited (Mcap: ₹13,300 cr) and Biocon Limited (Mcap: ₹22,500 cr). We notice that the inventory turnover ratio (ITR) of Divi’s Lab has been consistently lower than its above-stated peers. 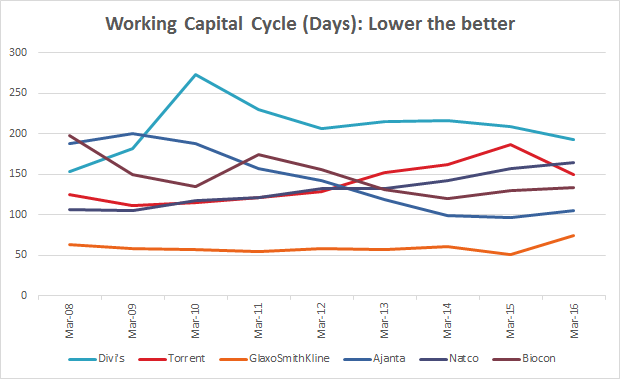 Similarly, when we measure the working capital cycle of Divi’s Lab in a number of days and compare it with its above-stated peers, then the investor notices that its working capital days are higher than the peers. (Working capital days have been calculated as receivables day + inventory days. We exclude payables days in our analysis as long payable days might be due to liquidity crunch with the company rather than its negotiating power with vendors). Inventory Days = 365/inventory turnover ratio. The working capital assessment of the company over the years indicates that the funds have been stuck in the receivables and inventory over the years, which has resulted in the cumulative CFO being less than cumulative PAT over last 10 years (FY2007-16). Over FY2007-16, Divi’s Lab reported a cumulative PAT of ₹5,592 cr. whereas over the same period, the company had the cumulative CFO of ₹4,711 cr. An investor should keep a watch on the operating efficiency parameters especially inventory utilization going ahead to ascertain whether the company is able to improve its working capital utilization going ahead. It is advised that the investor should do her own analysis in arriving at conclusions in such cases and not rely on management statements as managements are known to defend their decision irrespective of the final outcome. The investor would notice that Divi’s Lab has an SSGR of about 40-43% over the years, which is significantly higher than the sales growth rate of 18-20% being achieved by the company in the past. Even after adjusting for the factor of funds being consumed in the working capital (cCFO/cPAT) = 0.84 (4711/5592), it becomes evident that the company should be able to support a growth of about 30-32% (SSGR 40-43% * 0.84) without the requirement of additional funds for growth. The analysis of debt levels of Divi’s Lab over last 10 years (FY2007-16) indicates that the debt of Divi’s Lab has decreased from ₹154 cr. in FY2007 to ₹42 cr. in FY2016. The reduction in debt over the years with sustained sales growth indicates that the company is able to generate surplus funds over and above the requirements of the company. This assessment of SSGR gets substantiated when the investor analyses the free cash flow (FCF) position of Divi’s Lab. An investor would notice that Divi’s Lab has generated ₹4,711 cr. from cash flow from operations (CFO) over last 10 years (FY2007-16) whereas it has spent ₹1,957 cr as capital expenditure over the same period resulting in a free cash flow (FCF) of ₹2,754 cr. The presence of significant amount of FCF has ensured that the company has been able to reduce its debt levels despite stretched working capital cycle and ongoing capex. Moreover, the company has utilized the free cash to pay dividends to shareholders of about ₹1,458 cr and it still has about ₹874 cr. with itself as cash and investments. This strong cash flow position with optimal utilization of fixed assets has ensured that the company could increase its dividend payouts to shareholders with increasing profits. Such performance has been taken positively by the market and the market has rewarded the company and its shareholders handsomely over the past years. The company could achieve an increase in market capitalization of about ₹16,500 cr. over FY2007-16 versus the earnings retained and not distributed to shareholders of about ₹4,100 cr. indicating that a market value of about ₹4 has been created by the company for its shareholders for each ₹1 of earnings retained by it over the years. sums up to about ₹83.5 cr. per annum, which is about 7.5% of the PAT of Divi’s Lab for FY2016 (₹1,112 cr). We have noticed that the salary of promoters being about 2-5% over the years is an average across industries, which includes a fixed salary component and about 2% of commission on the profits generated by the company. The above remunerations though not exorbitant from the perspective of the percentage of net profits, seem high from absolute level perspective. We suggest that the investor should look the management assessment of Divi’s Lab both from the aspect of remuneration as well as an interesting observation, which gets highlighted when the investor analyses various exchange filings done by Divi’s Lab over last year. 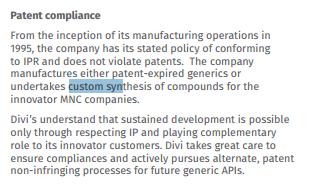 However, when the investor analyses the annual report of Divi’s Lab for FY2016, then she notices that M/s Divi’s Pharmaceuticals Private Limited is an associate company of Divi’s Lab where the key management personnel have significant influence. This is further evidenced when the investor tries to search for the directors of Divi’s Pharmaceuticals Private Limited. As per the corporate database Zaubacorp, the directors of Divi’s Pharmaceuticals Private Limited include Mr. Murali Divi and Mr. N.V. Ramana. The promoters might have other businesses in their personal capacity, which might be competing with Divi’s Lab in the same markets as the facility owned by Divi’s Pharmaceuticals Private Limited controlled by Mr. Divi and Mr. Ramana is being assessed by USFDA, indicating that Divi’s Pharmaceuticals Private Limited might also either be already exporting drugs/pharmaceutical products to US markets or is planning to do the same. Despite payment of significant salaries of ₹45 cr. to Mr. Divi and ₹23 cr. to Mr. Ramana, the promoters are not devoting their 100% professional calibre to Divi’s Lab and might be running personal competing businesses on the parallel. Divi’s Lab has given general responses to BSE without detailing the actual observations/alerts highlighted by USFDA. The observation of falsification of data, if true, assumes very high significance as it directly questions the integrity of the management and the corporate governance structure and practices at the company. In the past, there have been many cases where Indian companies in the pharmaceutical field have been found guilty of data manipulation to get the regulatory approvals. Among such cases, the investors would remember recent cases of GVK Biosciences being accused of manipulating clinical trials data in September 2014, which resulted in the suspension of approvals of multiple drugs in Europe, which were based on the clinical data of research/studies done by GVK Biosciences. Another such case, which has been consistently highlighted is of Ranbaxy, which has also been accused of and pleaded guilty to similar charges by USFDA. It is advised that the investors should be cautious and keep the above issue in mind while making any investment decision about Divi’s Lab. 1) NCF is lower than cash at end of year also a lot of cash inflow is happening from financing activity– what does that signify? Net cash flow (NCF) is the net change in the cash experienced by the company during a year. NCF is the sum of CFO, CFI and CFF. Cash at the end of the year is the sum of cash at the start of the year (which is same as the cash at the end of previous year) and the NCF during the year. The cash flow data indicates that in all the years during FY2007-16, Divi’s Lab has witnessed positive CFO and negative CFI and negative CFF. This means that the company received funds from operations (CFO) and used these funds to make investments in plant & machinery, mutual funds etc. (CFI) and to pay dividends to shareholders, repayment of debt etc. (CFF). 2) A lot of MF have reduced their holding in the company though not very significantly in FY 15-16, FII already hold 19.5%, is there upside left in this stock? We do not recommend taking investment decisions based on actions of Mutual Funds and other institutional investors as many times such institutions have to sell stocks to meet redemption requests from their subscribers. Their sell decisions might not be based on changing fundamentals of the investee company. 3) One promoter Nilima Motaparti holds 20.34% shares, couldn’t find out about her. In case the details about any promoter are not available in the public domain, then the investor may approach the company related to her queries if she has any. 4) OPM% is dropping year on year, it could be linked to company’s pricing power. How do we find out the reasons for this? 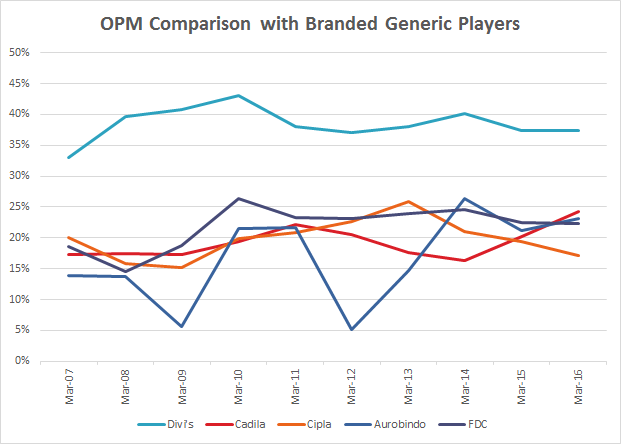 The decline in OPM might be a result of declining power of any company over its suppliers. The analysis of the company above deals the comparative aspects of the OPM of the company with its peers. We suggest that the investor should look deeper into it by getting in touch with the company, its vendors, suppliers, competitors etc. by doing primary research. 5) The tax rate is less than the corporate rate which could be because 2 of the plants are in SEZ, how can this be confirmed? An investor may get the confirmation from the company by contacting the investor relationship officer assigned by the company. 6) Debt is negligible but on the rise for last 2 years. Should that be a cause for concern? As mentioned by you, the debt levels are low when compared to the overall cash position of the company and should be a cause of grave concern if the provided information by the company in its financial statements is correct. Divi’s Lab is currently available at a P/E ratio of about 17-18, which does not offer any margin of safety in the purchase price as described by Benjamin Graham in his book The Intelligent Investor. However, as discussed above, the reported financial numbers of Divi’s Lab seems to have a good margin of safety in terms of its business as reflected by good SSGR and FCF position. 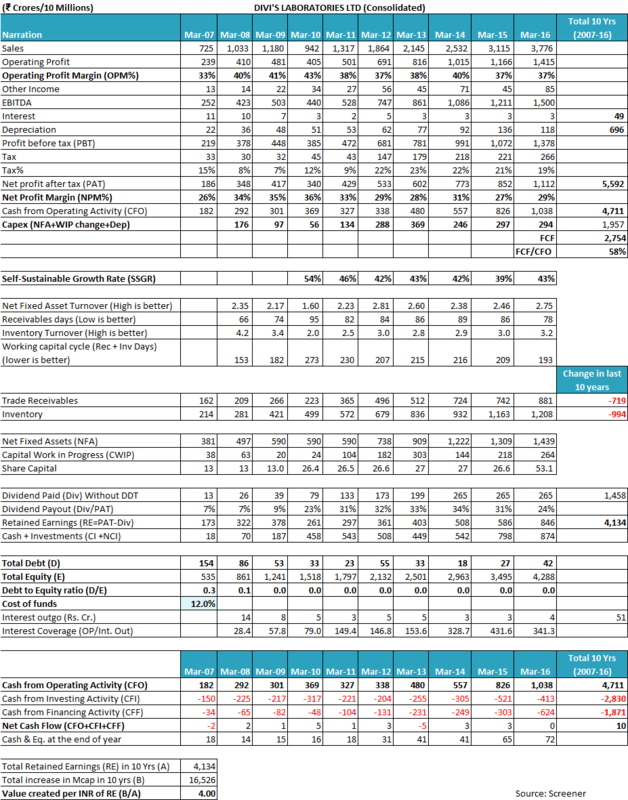 Overall, Divi’s Lab seems to be a company growing at a descent pace of 18-20%, with good profitability margins. However, the profitability margins of the company seem significantly higher when compared with its peers. The company seems to have been managing its cash positions well with optimal utilization of its capital investments and has been able to meet its entire capex requirement from its internal accruals. The company has been facing higher working capital cycle than its peers and it remains to be seen whether the company is able to improve the same in future. However, good cash flow position of the company has ensured that the despite higher working capital cycle, the company has been able to avoid debt burden. The company management seems to be taking high salaries but might not be devoting full attention to company’s business. It might be that the promoters are running parallel competing businesses in their personal capacity. The recent news about the probability of USFDA detecting falsification of data by the company are significant and the investor should dig deeper and monitor the developments around it as it questions the integrity and corporate governance levels at the company and promoter level. These are my views about Divi’s Lab. However, you should do your own analysis before taking any investment related decision about Divi’s Lab. Thank you for your quick response. I am still curious and want to highlight some of my thoughts. You are right, it is not right to say upfront that the high working capital days are a moat for any given company. As you rightly mentioned API is a sort of commodity business with no major price differentiation. However, in case of Divi’s Laboratories Ltd there are two things to be considered. First, if we look at the Annual reports (FY16 – Pg no. 50) and other company documents, we understand the company derives around 50% of its total revenue from Custom Synthesis business (CRAMS). In custom synthesis business it is involved in throughout the drug development stages i.e. the discovery and development stages. 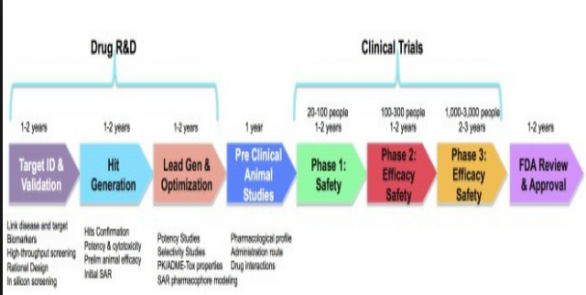 The company is involved in the research for these drugs ranging from the initial stage of the drug to development stage till drug is fully developed. Right from the development of a molecule at the innovator’s end till the expiry of the drug, Divi’s Laboratories Ltd helps its customers in each stage. It is worth noting, this business requires good chemical skills and long-standing relationships with the customers (sensitive information of the customers is to be shared). Needless to mention this is a high margin business. This may also lead to the company to manufacture patented products once the patent is commercialised. Again high margin products. Second, in the API business, Divi’s Laboratories Ltd manufactures very complex APIs which command better margins. Further, it has a clear standout strategy of not entering the territory of the innovator and violates patent norms. This has helped the company to have very strong relationships with its clients. The business model of the company is driven by complex chemistry and long-standing relationships with its clients. The high margins CRAMS business comprises around 50% of the total revenue, to an extent explains the high margins. It is widely accepted that when operating margins are very high in a competitive business there may be a cash of numbers being cooked. The best one can do to decipher that is a thorough analysis of Cash Flows and Quality of earnings. The concern regarding the high working capital (generally a sign of Shenanigan) is worth if it badly impacts the overall cash generation of the business. 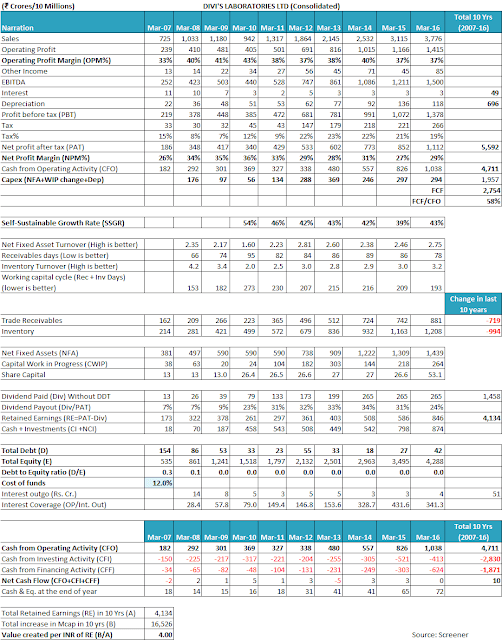 I have tried to look at some numbers to see the impact of the high working capital on the Divi’s Laboratories Ltd overall cash flow generation. Over the period of 10 years company has been able to generate way more cash than it has invested. And positive free cash flows for a long period of time are something cannot be ignored. Any financial gimmick in the majority of the cases would be reflected in the cash flows. However, in the case of the Divi’s Laboratories Ltd cash flows are very strong and support the argument that high realization covers up the high working capital requirements. If we look at the generation of the cash flow from Operations (CFO) the most critical part of the cash flow is the changes in the working capital changes. Let us call cash flow from operations before working capital changes as ‘Gross Cash Flow from Operations’ (GCFO) and cash flow from operations after working capital changes as ‘Net Cash Flow from Operations’ (NCFO). As a shorthand, while providing working capital loans/auditing the books of accounts, we use NCFO as a % of GCFO. This number essentially signifies the quantum of the working capital requirement in the business. In a trading business, it is expected to be 100%. And in the case of a manufacturing company, anything above 60% is considered reasonable. The 60% goes with the assumption that 40% is stuck in the working capital requirements, which is reasonable. Since Divi’s Laboratories Ltd is a manufacturing company and aggregate NCFO as a percentage of GCFO for last 10 years has been 64%, which shows the amount of money stuck in the working capital is within the acceptable limits and gives a little scope to the company to cook its book. One of the metric to look at the quality of the earnings is to see the earnings to cash conversion ratio. The ratio is better if closer to 100%. In the case of Divi’s Laboratories Ltd, it has been very robust and stood at 80% if we look at the aggregate data of last 10 years. Thus, the cash flow seems to be very strong. As we know any fraud/cooking of the books generally gets reflected in the cash flows, it is very difficult to establish that the company might be cooking the books. Thanks for your valuable time. Request you to correct me if I am missing out something. Many thanks for providing your valuable inputs. We appreciate the hard work that you have put in while preparing your write up by calculating various financial/cash flow parameters and taking out relevant information from other documents like the annual report and doing the peer comparison. You are right that most of the cases of accounting manipulations revolve around dressing up the financials so that the companies can appease various stakeholders like lenders (to take more debt) or equity shareholders (to get high share price, esp. true in case of companies run by professionals where significant part of wealth of management is locked in ESOPs). In the case of Divi’s the financials reflect a good cash flow position, which despite high working capital needs, is able to spare ample cash in the hands of the company. As far as the complexity of products and the association with the customers through all stages of the life cycle, which are leading to higher margins, we believe that currently, the word of the management is the only available source of information. Let’s hope that what they have stated in the annual report about various policies in the annual report is being followed on the ground as well. The first most test of the same is the current FDA issue being faced by the company. Let’s hope the company gets out of it soon and focus on delivering value to its stakeholders (customers as well as shareholders).